Wow! Tenerife towns and cities is going to be a big subject! As always, if there's any village (no matter how small) you'd like me to include, or, if you want to tell me I've missed something, or, if you'd like to add anything yourself, feel free to do so, via the "feedback" link. The capital city, not only of Tenerife, but of the whole of the Canary Islands, a title it shares with the city of Las Palmas, in Gran Canaria. A sophisticated tourist destination in the south west. Nestling in the southeast of the island, a quiet, picturesque village. A tiny Canarian village that is a major administrative centre. A quiet, traditional Canarian town on the west coast - with a world-class golf course! On the east coast, not far south of Santa Cruz, this town is a place of pilgrimage and houses the Black Madonna, the patron saint of the Canaries. In the southeast, this town, as well as being a famous centre for windurfing, is a quiet, laid-back tourist destination. Found on the northwest coast, this tranquil town is in the centre of the island's wine producing region. 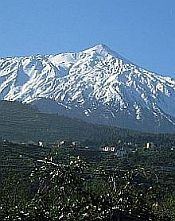 Head town of the third largest municipality in Tenerife. A quaint, sleepy town in the southwest. A town and municipality on the east coast, home to the famous pyramids. A quaint Canarian town, home to the famous Dragon Tree. See SAN CRISTOBAL DE LA LAGUNA, below. A genuine, unspoilt, Tenerife town, in the north. Again in the northwest, La Orotava is Tenerife's most stylish town. A must for culture vultures. A tranquil Canarian town on the south coast. A small, tranquil fishing village on the south-east coast. Situated on the south coast, one of Tenerife's most popular tourist destinations. A tourist town in the south-west that's got more than just big cliffs! A picturesque village near Puerto de La Cruz, of much historical importance. Another picturesque village, situated in the Teno region in the northwest of the island. The famous "lost" village nestling in the mountains in the northwest of the island. An artificial holiday resort created in the 60s, on which some people, unfortunately, base their perception of Tenerife as a whole. North Tenerife's top tourist destination. A charming, one-time fishing village sandwiched between Los Gigantes and Playa de la Arena. Situated next to Santa Cruz, this city, known as "La Laguna" for short, is considered to be the cultural capital of the Canaries. It is located on the northern edge of the island, Tacoronte is mostly rural farm land, dotted with small urban areas. Business and tourism is gradually moving into the area. It is also the home of the exclusive Tenerife Royal Golf Club. A tranquil town that is a taste of true Tenerife. At 3,800 feet, Vilaflor is the highest village in Tenerife. It's a big subject! There's more to come from Tenerife towns and cities, but you'll have to be patient.